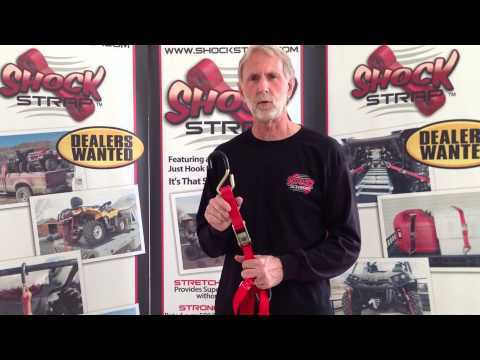 I started using ShockStraps in 2007 after seeing them at a trade show in Salt Lake City. Since that time, I have used them to tie down ATV’s, snow mobiles,UTVs, tarps, and to keep things locked down on my trailer. In fact, I still use my original four straps and have purchased more. Recently, I was on a hunting trip in Arizona and the guide, Duwane Adams of http://arizonabiggamehunting.com/, used ShockStraps to keep his UTV tied down. I asked him what he liked about them and he said he liked that they won’t pop off like a ratchet strap when you hit a bump or are driving on washboard roads. In fact, he was looking for more ShockStraps to buy and didn’t know where to find them. I told him I would send him some when I got back to Utah. When I went to my ATV dealer to buy them for Duwane, I found that the company, ShockStrap was for sale, so I purchased it. As the new owner, I am proud to carry on the vision of the original designers. ShockStrap was engineered in 1998 and widely recognized as the first significant advancement in engineering for Tie down and Ratchet Straps. ShockStrap was designed because vehicles too frequently lost their loads or had their loads significantly damaged by traditional straps loosening or totally disconnecting. The reason for loosening or disconnecting was because of occasional potholes in roads, sudden swerving, or the bounce in most off-road driving. The first ShockStrap was sold in California and the corporation has remained privately held. 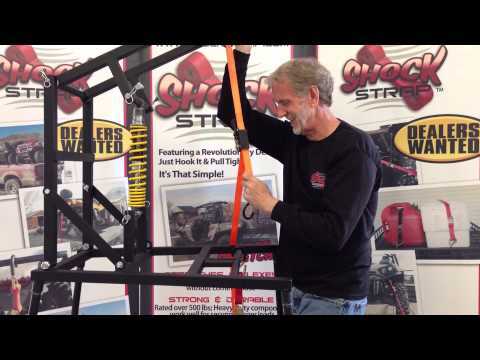 The focus of ShockStrap has always been to insure the safety of the load and the driver. ShockStrap loyalty is huge and a growing reseller base has allowed for on-going product development. We look forward to serving the needs of our customers and the industry.